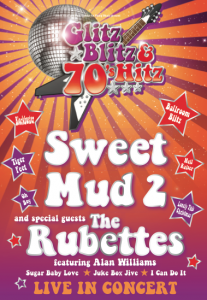 We’re thrilled to announce the Glitz Blitz and 70’s Hitz 2015 U.K. tour. The Guys appear as ‘Special guests’ with ‘Sweet’ headlining and ‘Mud 2’ also featuring. All performances will be at Major theatre venues throughout England and Scotland. Venue details, yet to be confirmed, will eventually be found on our Tour schedule. It’s the guys first U.K. tour for some time so don’t miss it. Tickets to be announced soon.